ZIMBABWE – The inaugural edition of the highly-publicised music concert, “Celebrate Local”, organised by Jive Zimbabwe and held at the Harare International Conference Centre on Friday, left the organisers counting their loses after a massive flop. The show, featuring top and upcoming artistes including Mokoomba, Victor Kunonga, Hope Masike, Alexio Kawara, Clive Chigubu, Tariro neGitare, Edith WeUtonga, Bryan Kadengu, Trish The Word, Clare Nyakujara and Willom and Gary Tight failed to attract the expected numbers. Jive Zimbabwe founder and director Benjamin Nyandoro told NewsDay the flop probably meant the model they used was untenable. “I have come to question the model of smart partnerships whether it works. Some people might not realise our vision of this concept, which we propelled after realising that Zimbabwe’s arts sector was playing second fiddle to other countries because local content was not promoted,” Nyandoro said. He said musicians, producers, promoters, media, government and the corporate world should come together and incorporate this idea of smart partnership. “We need each other when it comes to promotion of local artistes and hosting shows. There is no way we can compete with other artistes on the continent if we don’t have platforms like the Celebrate Local Concert,” he said. Nyandoro said regardless of the glitches they encountered they remain committed to hosting the concert quarterly. “I want to salute all the artistes who took the leading and setting the tone high for the sustained campaign toward greater utilisation of local products and services. Celebrate Local concert is a living vision that is set to change the attitude towards consumption of local products and services,” he said. He also took to social media Facebook to apologise for the failure. “Our sincere apologies, Jive Zimbabwe takes full responsibility of sad developments experienced at the inaugural Celebrate Local Concert. Our partner, who provided the Public Address (PA) System, could have done a better job, both time and quality of service,” Nyandoro wrote. to complete sound set up at 10pm, two hours late into the concert. Despite the poor attendance some of the artistes put up spirited performances during their separate sets. 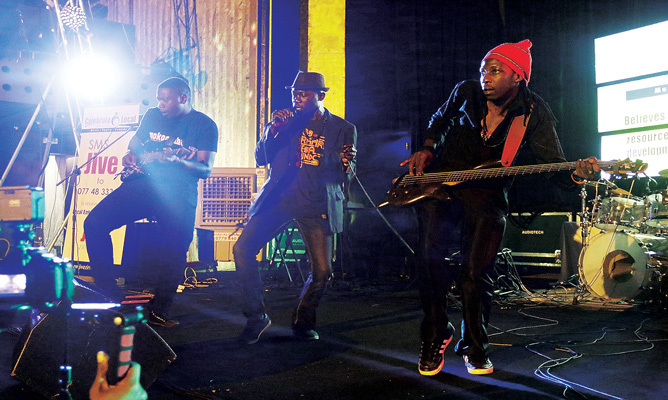 From the fan’s reactions and gestures it was the celebrated Afro-fusion group Mokoomba that proved to be their favourite as they went on to put up an eye-catching performance. The internationally acclaimed group got the crowd clapping, dancing and singing to most of their tracks during their set.